While in Seattle for IFBC, a group of 8 bloggers from Tampa FL headed out for the Savor Seattle Pike Place Market Food Tour. We met up with our amazing tour guide Rich to learn history of the Pike Place Public Market. We started outside the Market theater, home of one of many Seattle landmarks -the gum wall. Something totally disgusting and beautiful at the same time. Of course I had to leave my marking. After heading into the market, our first stop was at Daily Dozen Doughnuts and we were welcomed with bags of hot mini doughnuts topped with sugar. I am not a doughnut girl but I am marrying a guy who requested a Krispy Kreme cake as his 30th birthday cake. I would say he would approve of these little guys! After we were finished with the doughnuts, we headed to MarketSpice, a specialty tea and spice store that opened in 1911. I instantly fell in love with the charm of this store. I am a spice addict and my cabinet is out of control. A little overwhelming for someone like me, I couldn't decide what to buy. Luckily, MarketSpice has an online shop and I do plan on shopping away! We sipped on one of their best selling tea's while checking out the goods. Now for my 5 seconds of fame. 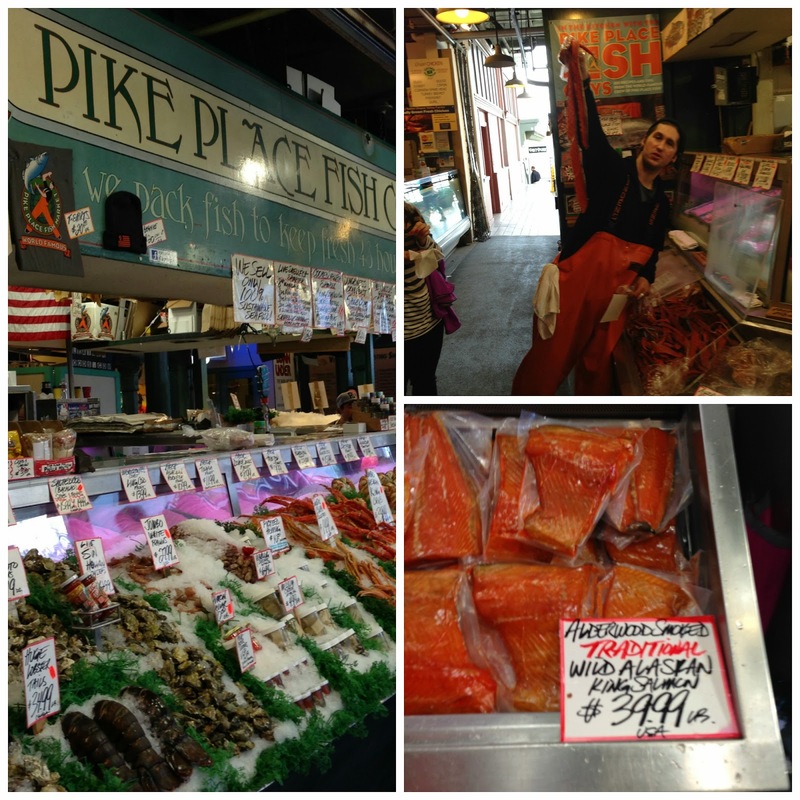 If you have read my bucket list, you're already aware one of my items was to catch a flying fish at the world famous Pike Place Fish Market. We were welcomed by very enthusiastic fish mongers and got to try out 4 types of smoked salmon (including candy salmon!!). When it came time to watch the guys throwing fish, we received an exciting show. Sadly, my phone didn't turn to video fast enough. Luckily, they asked if anyone in the audience wanted to catch a fish, to which I jumped. Even luckier, Jen caught it on video and Leslie took plenty of photos. The excitement in my face and the fact I hugged a huge raw smelly fish in my Burberry jacket shows how proud I was that I actually caught the fish (I was panicking). After leaving the guys, we visited Franks Quality Produce, a family owned and operated fruit stand who sell to the public and wholesale to many local restaurants. I do not like peaches but tried one handed to us and good lord, it was the most amazing piece of fruit I have ever consumed and I wanted more....so I took seconds. We took some time to stroll through Pike Place Market, visiting Chukar Cherries.We sampled multiple dried and candied cherries from their menu. You could easily see why this is such a popular mail order company. While in the market, we saw many stunning flower bouquets, priced at $15 for the highest. If we lived in Seattle, there would be no excuse for Gabe not to bring me home a bouquet of fresh flowers on a weekly basis. Up next was Beechers Handmade Cheeses, a very famous cheese shop who is widely known for their Mac and Cheese and artisan grilled cheese sandwiches. The Mac and Cheese was creamy and delicious. It had a hint of spice to it and tons of cheese. Going to Beechers is a must visit for anyone in Seattle. Speaking of must visits, our next stop was Pike Place Chowder. This chowder was legit - and I am going on a limb here by stating it was better than chowder I have feasted on in New England. Apparently I am not the only one who feels this way - Three years in a row, Pike Place Chowder was named “Nation’s Best Chowder.” After the third win, our New England Clam Chowder was retired from the competition and inducted into the Great Chowder Cook-Off Hall-of-Fame. IT WAS THAT GOOD. Around this time, all of us were going into food coma mode with two more stops. Piroshky Piroshky was next, a Russian bakery known for Piroshkies! This was the first time I have tried this Russian Pastry, which comes savory or sweet. We tried both, an apple cinnamon and a beef and cheese. Both piroshkies were awesome but the beef and cheese was out of this world. Finally, last but not least was one of Tom Douglas's restaurants, Etta's. We sampled Etta's crab cake and it was so good that we came back for dinner here later that night but I will do a separate post on that magical experience. I would strongly suggest anyone visiting Seattle for the first time to experience Savor Seattle Pike Place Market Food Tour. You get to see many Seattle landmarks while trying multiple bite size samples of delicious foods. It's the only way to experience Pike Place for the first time. Multiple high fives to our Tour Guide Rich for such a memorable experience on my first trip to Seattle! By the way, you look like the swankiest businesswoman ever in your Burberry coat because you have the audio set that looks like a bluetooth device haha. Looks like an amazing food-venture. I want that chowder!